In our humble opinion, burp cloths are among the few true must haves for the first few months of your baby’s life. We like to stash burp cloths all over the house for those unexpected moments when a fountain of milk strikes or when a diaper fails to live up to its leak-free promise. We use them for changing mats in a pinch, shields from stray streams, and even props for a distracting game of peek-a-boo. Two Blue Peas has always loved the super-absorbent, double layered terry burp cloths from Bebe au Lait, and the narrow, shoulder shaped bargain burp cloths from Carter’s. And we still do! But we recently decided to craft some of our own to give you burp cloth options in our Pea-ssentials line. 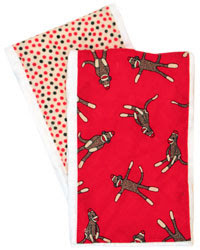 The new Two Blue Peas burp cloths come in pinks, blues, and neutral sock monkeys. They are made from double layered pre-fold diapers with an extra center panel for maximum absorbency. They wash like a dream, can be monogrammed for personalization, and are guaranteed to survive use after use after use after use...well, you get the picture. These burp cloths are solid! A bundle of NEW Angel Dear bundles! NEW WubbaNub Pacifiers are here!